Lynne Marcus, CPA, CFP, holds a BA in Accounting from Queens College and an MBA in Finance from St. John's University and a Certified Financial Planner designation from the College for Financial Planning.. Ms. Marcus holds an insurance license. Ms. Marcus began her accounting career with Price Waterhouse and Co., in their Small Business Department. She has worked in both large and small companies including Citibank, Western Union International, and the New York City Board of Education. Her experience includes banking, real estate, service and retail organizations. Lynne is currently president of the Florida chapter of the National Conference of CPA Practitioners and Secretary of their national organization. In her current practice, Ms. Marcus offers computerized accounting and bookkeeping services, tax planning, budgeting, estates, and trusts. Lynne is also a frequent guest speaker and lecturer on these subject areas. She has spoken at the New York State Society of Certified Public Accountants, Citibank, Chase Manhattan Bank, Chemical Bank and Key Bank as well as Fortune 500 Business and Professional Women and other charitable, fraternal and professional organizations. Ms. Marcus held the title of Adjunct Professor at Queensborough Community College, Adelphi University and Nassau Community College where she taught Accounting and Auditing courses. She was on their advisory counsel for the Foundations Program and was the 1992-1994 Chairperson for the NYS Society of CPA's, Nassau Chapter - Personal Financial Planning Committee. 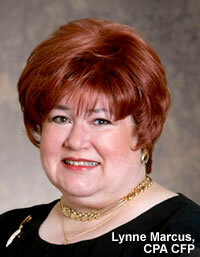 Lynne was a Board Member of the Gold Coast Chapter of the Financial Planning Association. Lynne is a member of the major Accounting and Financial Planning professional organizations, The National Honor Society in Economics and The International Who's Who. She has been quoted and has written articles in the "New York Times", "Money Magazine", "Personal Financial Planning Magazine" the "Women's Record" and several local publications. She was listed in "Who's Who in America ", Who's Who in the East" and the International Edition of "Who's Who in Business and Professionals."